Give your salon a vibrant and colorful atmosphere with the stylish ANS Legato. The ANS Legato is a custom-made, wooden pedicure spa that features a unique neon lighting system. Impress your customers with the modern looks and Zen style of this custom-designed pedicure spa. This sharp pedicure spa is acetone-resistant and includes a protective gel-coating that guards the spa and sink from rust and corrosion. The ANS Legato features a remote-controlled neon light system, an adjustable footrest, polished chrome hardware, stainless steel shower hose, built-in LED color therapy light, FREE matching pedicure stool. In addition, optional drain pumps are available and can be installed onto your spa. 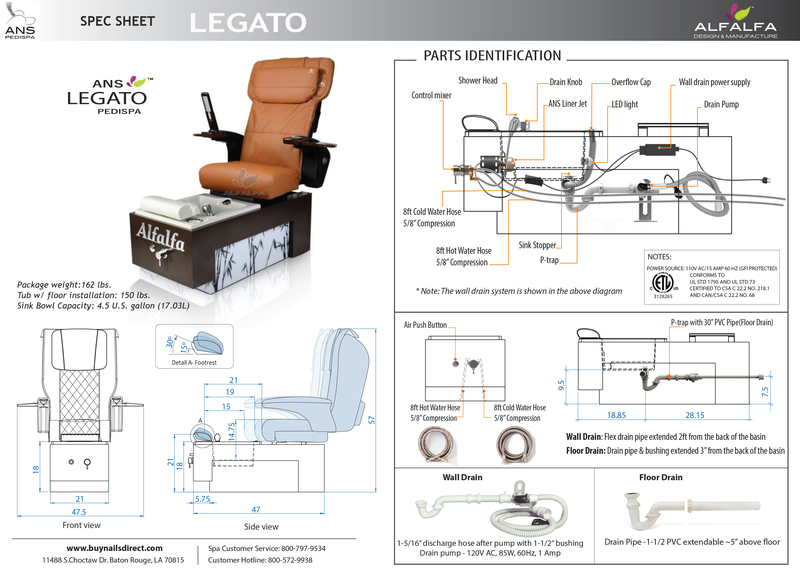 The ANS Legato also includes a premium ANS massage chair of your choice. – It’s your air, keep it fresh! Functional, yet beautiful, the ANS Legato features two optional suction vents located on the sink of the spa. The vents help improve your salon’s air quality while providing a safe environment for you and your customers. Create an atmosphere where your customers can relax by giving them clean and fresh air! The ANS Legato includes a stunning neon-light system that changes colors with the press of a button. The ANS Legato is custom-made and custom-built with your choice of custom wood-laminate colors. Each spa is handcrafted by our expert carpenters according your details and specifications. The ANS Legato includes a fiberglass sink bowl of the color of your choice (Jade, Gray, or Cappuccino). Each sink includes a protective gel-coating that guards against rust and corrosion to help extend the life your spa. Each ANS Legato includes accent panels of the design of your choice. Choose from Bamboo Garden, Olive Leaves, Sweet Vine, and Country Flora. The name of your salon can be engraved onto each ANS Legato; your choice of font style. Each ANS spa is equipped with the exclusive ANS Liner Jet. Our pedicure spas utilize state-of-the-art Liner Jet Technology and are compatible with ANS Disposable Liners. The innovative ANS Liner Jet is damage-resistant, magnetic, pipe-less and easier-to-use than other jets. The ANS Liner Jet sets new standards for safety and sanitation because of its advanced architecture, pipe-less jet flow, and ease of cleaning. Make sure your customers receive the safest and most hygienic pedicures with the ANS Liner Jet. Simply snap apart and soak in sanitizing liquid. No scrubbing or cleaning in hard-to-reach areas. The iFill2 is an optional pedicure spa control system that can be installed onto your pedicure spa. This great system allows pedicure technicians to manage all functions of the spa in one convenient control mechanism. The iFill2 controls the jet, the drain, LED light, the shower hose, and the automatic water fill sensor. The iFill2 detects water levels of the pedicure spa and automatically shuts off the water faucet, saving time and money; great for busy salons. Each pedicure spa includes your choice of one of our high-quality massage chairs. Our superior quality chairs are made with soft, stain-resistant, marine-grade PU-leather and feature human-like, shiatsu massage. These exceptional chairs are acetone-resistant and use an advanced massage mechanism that feel like real hands (kneading, rolling, and percussion), whereas other chair brands only offer dull vibrating massage. Our first-class massage chairs feature a remote control, auto/manual massage programs, power seat controls, reclining backrest, pivoting armrests, built-in cup holders, side armrest trays and pockets for storage. Select from popular models and genuine brands like Human Touch and ANS Massage Chairs. The ANS P20+ is modern pedicure massage chair that increases comfort and improves relaxation. The PLUS difference is in the chair's unique LIFT engineering. Unlike most massage chairs, the ANS P20+ is capable of lifting 6 inches from its base to provide extra leg room for tall customers; very convenient feature for busy salons that want to offer maximum comfort to their customers. The ANS P20+ Massage features soft, stain-resistant PU-leather. Each ANS P20+ is equipped with an advanced massage mechanism that includes auto and manual programs for kneading, percussion and rolling massage. For extra comfort, the ANS P20+ reclines from 90 to 130 degrees, and moves back/forth up to 7 inches. For convenience, this luxurious massage chair includes an embedded control, purse hangers, cup holders, and back storage pocket. The ANS P20+ also adds a touch modern functionality with 2GB of MP3 storage. Upload your favorite songs and let your customers enjoy your best playlists. Even more, the ANS P20+ resists chemicals and acetone to give the chair a longer lifespan. Improve your salon and upgrade your pedicure spa to the ANS P20+ Massage Chair. You will earn 2199 Points for purchasing this product. The newly-released Legato V Vented Pedicure Spa comes equipped with two powerful vents that filter nearby toxins and fumes. The vents satisfy new state board requirements and keep your customers feeling safe and protected from harmful dust. This stunning pedicure pa features a unique neon-light system that changes colors with the press of a button. The Legato V will give your salon a trendy and vibrant atmosphere as well as improve the air quality and overall health of your business. The Legato V is available in multiple custom wood laminate finishes and is carefully hand-crafted by our expert carpenters. In addition, the name of your salon can be engraved onto the front of the Legato V, making each spa unique and original. Each Legato V is made-to-order following your specifications. 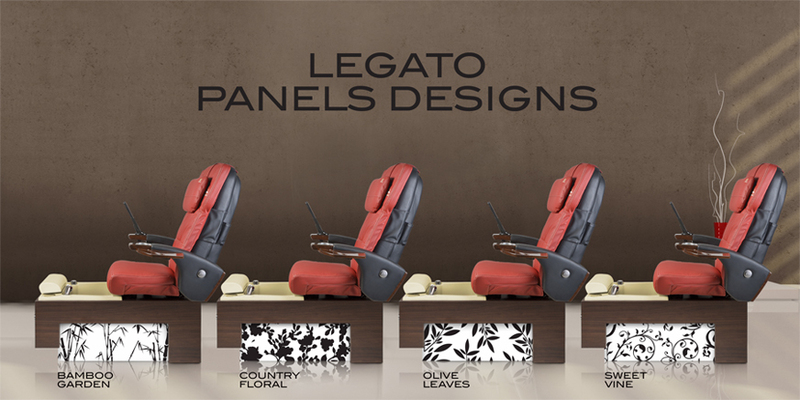 For convenience, the Legato V has removable front and side panels for easy access to the interior of the pedicure spa. The Legato V also comes equipped with a powerful ANS Liner Jet for a soothing whirlpool effect. Each Legato V features a fiberglass sink bowl of the color of your choice; an adjustable waterproof, fiberglass footrest; an easy-to-control, front-mounted faucet; a pullout, multifunction shower head; an embedded LED light color therapy; free matching pedicure stool. Each Legato V includes a genuine Human Touch Massage Chair. Human Touch massage chairs come in a variety of colors and are made with soft, marine-grade leather. Human Touch is the #1 massage chair brand in the USA and is featured in thousands of salons nationwide.